The previous generation UE Boom 2 was one of our favorite waterproof speakers of all-time and for good reason – it had a rugged design that could take a beating, got incredibly loud, and sounded great for the money. For the third generation UE Megaboom 3, Ultimate Ears didn’t change the formula much, but that’s not a bad thing. The design is slightly more refined, battery life is still excellent, and buyers can get the speaker at a lower price. All said, for $200 (£170 / AU$300), you get a lot for your money. The UE Megaboom 3 strikes an excellent compromise of portability, power, and sound quality in its class. Sure, some speakers around the same price like the LG PK7 sound even better, but it’s huge and cumbersome to carry around. 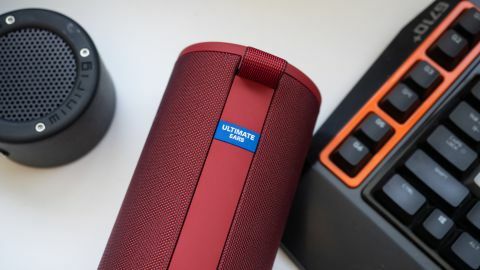 Ultra portable speakers like the UE Wonderboom sound great for the size but just can’t match the battery life and sound quality that the Megaboom 3 provides. The design of the Megaboom line of speakers hasn’t changed much over the years - but why mess with something that works? The UE Megaboom 3 is the same cylindrical shape we know and love, but feels more refined overall. The stiff buttons of previous models are gone and replaced with more tactile ones. There’s also the addition of the “Magic Button” at the top which allows you to control music playback and launch one-touch playlists from Apple Music or Deezer. This means you can get your music nearly instantly if you use either service, however, the button doesn’t support one-touch playlist support for Spotify, nor does it activate your phone’s voice assistant. UE moved the charging port to the bottom base of the speaker for easier access – and, unfortunately, you still have to use the dated microUSB connector for charging the speaker. If you don’t want to deal with cables at all, you can purchase the optional $40 (£35, AU$50) Power Up wireless charging dock that also serves as a docking station when you bring the speaker home for the day. The other new feature UE added is DJ mode, which lets you invite up to two other friends to help you take turns controlling the mix. This utilizes the speaker’s multipoint Bluetooth pairing and it can all be controlled via the Megaboom app. It's a gimmick, sure, but certainly a clever way to allow your friends to control the music. The first thing that you notice about the UE Megaboom 3’s performance is just how incredibly loud the speaker gets – half volume is enough to fill a medium-sized room. Crank the speaker to 100%, and you’d better be outdoors where you have to compensate for ambient noise. This speaker really kicks. Thankfully, it not only gets loud, but the sound quality is good as well with boosted bass that has good impact and highs that never sound harsh. That said, however, we found the mids to be more recessed than we’d like, letting vocals take a back seat to the speaker’s bass and highs. Compared to the similarly priced JBL Pulse 3, the JBL manages to project sound much wider, punch harder at the low-end, and makes vocals stand out. However, the Megaboom 3 wins out in terms of durability and battery life (20 hours here vs the JBL’s 12). Speaking of battery life, the UE Megaboom 3 offers a staggering 20-hours of playtime and we found that number to be accurate if you’re playing music around 25% volume. Crank it up and expect the battery life to drop several hours. The UE Megaboom 3 is an iteration on an already great speaker, with small refinements across the board making it the best waterproof speaker UE has made to date. The speaker features a rugged drop and waterproof design, all-day battery life, and gets incredibly loud. On top of it all, UE lowered the price, making the Megaboom 3 excellent value for money. If there’s one thing we can nitpick about the UE Megaboom 3 it’s that, while it’s sound is good, it could be improved. The speaker provides good bass extension but we think there’s room for more impact, and its mids are recessed, making vocals less exciting than on other speakers. The JBL Pulse 3 sounds better to our ears thanks to its ability project farther and put vocals front and center. The JBL also punches harder at the lower frequencies. However, the UE has it beat on battery life, with 20-hours of playback vs the JBL’s 12 (slightly longer if you disable the light show).